As I have previously mentioned I will be going on my honeymoon later this year. As ever, I will want to look my best, but due to a weight limit I cannot physically take all of my make up and beauty electricals with me on top of clothes! I came across ego professional online and just had to try this out. I have quite thick hair and usually travel hair dryers take hours, so one evening last week I decided to put this one to the test. This set is going to be a god send, it is the Ego Trip, more can be read about it here. The set includes a travel hair dryer and diffuser as well as travel hair straighteners. The hair dryer is surprisingly powerful for a travel dryer, usually these things take hours to dry my hair but this one barely took any longer than usual one! It is advertised as being 60% more powerful than other travel hair dryers and I would definitely agree! The straighteners were easy to use, it took a little more time than usual as they are smaller than normal straighteners. I have never used travel ones before but they were light and straightened my hair easily. The set is £39.99 to purchase which is great value as for that price you get both tools! 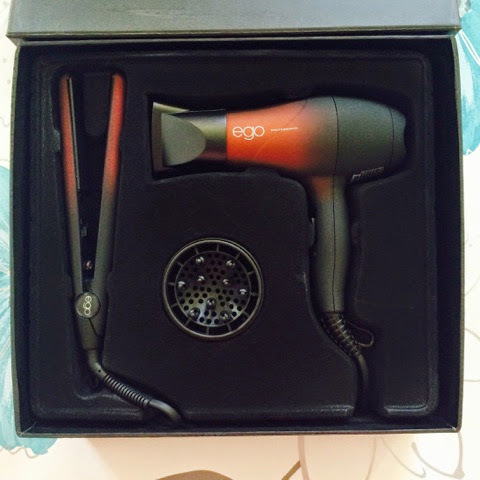 You can buy it online from www.egoprofessional.com or it is available in Boots.